The tooth fairy has a lot to live up to after a US dad took extreme measures to make his son’s wobbly tooth ready for collection. Rick Rahim brings new meaning to the term helicopter parent, falling back on his 1000 hours of flying experience to help extract the stubborn tooth. In a video posted to Facebook, a string attached to a helicopter is tied his son’s loose tooth. 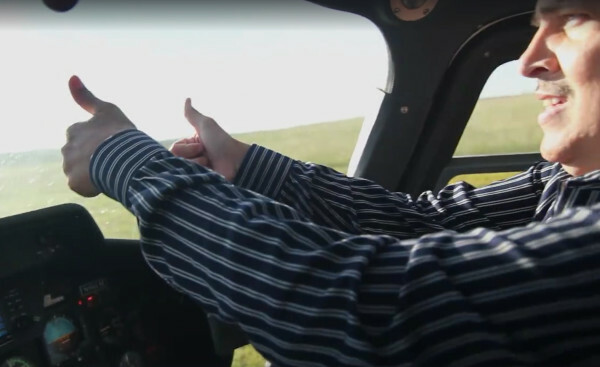 After signalling with thumbs-up, Rick gradually flies the helicopter backwards and within minutes is victorious. As he emerges from the helicopter, the unconventional dad holds up the string with the tooth attached. Does this make me a "helicopter parent? "Do fun, creative stuff with your kids.Make memories together. With the mission complete, Rick finished the video with a disclaimer. “Look, guys, do everything safely and that’s what I did today,” he says. “I flew the helicopter backwards away from all the human beings, and you’ll notice we had plenty of room on the left and on the right, should there have been any sort of emergency. “I want you to know that what we did today was perfectly fun, perfectly safe, and I’m a 13-year veteran of flying helicopters with over a 1000 hours. Rick isn’t the only father to use extreme methods to pull a tooth, seven-year old Cayden Sullard’s dad encouraged him to make use of a bow and arrow in a video we dare you to watch.